This tiny moth is sunning itself on the west wall of the school. It is less than three-quarters of an inch long. In the 3:30 winter light its scales are almost silver. The digital camera lets me see the furry and feathery edges. The wings overlap like royal kimona sleeves. 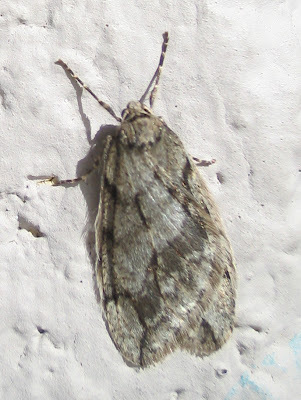 Can't decide if this moth would best inspire a gown with translucent layers of mottled gray chiffon, a full-length fur coat, a silk cape sewn with silver threads and beaded with hematite, mica, and pearls, or a ski sweater of Peruvian alpaca yarn! I doubt there will be many designs as breath-taking on the Oscars red carpet.